The conference marks Russia’s attempt to get the Afghan authorities and the Taliban together at negotiating table. Russia is hosting peace talks in Moscow to end the war in Afghanistan, drawing delegates from the West-backed Kabul government and a group representing the Taliban, as well as representatives from a dozen nations, including the United States. Opening Friday’s meeting, Russian Foreign Minister Sergey Lavrov said that the participation of both Afghan leaders and the Taliban was an “important contribution” aimed at creating “favourable conditions for the start of direct talks”. Russia hopes “through joint efforts to open a new page in the history of Afghanistan,” the Russian foreign minister said. He emphasised the threat posed by the Islamic State of Iraq and the Levant (ISIL, also known as ISIS) in Afghanistan, saying that it has relied on foreign sponsors in a bid to “turn Afghanistan into a springboard for its expansion in Central Asia”. Pakistan, which has long been accused of providing support to the Afghan Taliban, would “definitely” attend, foreign ministry spokesman Muhammad Faisal told AFP news agency. India has also sent its representatives at a “non-official level”, reassessing its policy on talks with the Taliban group. The conference marks Moscow’s attempt to get the Afghan authorities and the Taliban together at a table. The US Embassy in Moscow has sent a diplomat to observe the discussions. Russia’s first attempt to hold the conference in September fell through after the Afghan authorities refused to attend. This time, the Afghan government hasn’t sent its envoys, but members of the government-appointed Peace Council are attending the event. 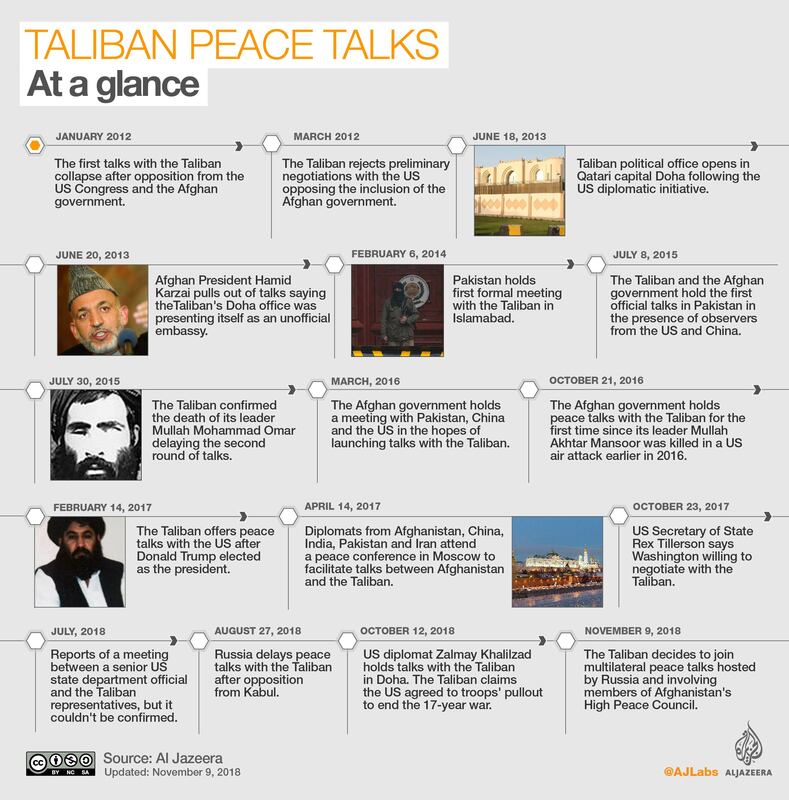 Taliban officials and Peace Council members have met at past forums elsewhere, and while no formal talks were ever held they have had some face-to-face discussions. The talks come weeks after newly appointed US special envoy for peace in Afghanistan, Zalmay Khalilzad, held talks with the Taliban group in Qatar. He will visit Afghanistan, Pakistan , the United Arab Emirates and Qatar from November 8 to 20 to push for peace negotiations with the Taliban. Khalilzad’s meeting with the Taliban, which was overthrown from power by US-led forces in 2001, is part of efforts to find a way to end the 17-year-long war in Afghanistan. “On his last trip to the region in October, Special Representative Khalilzad called on the Afghan Government and the Taliban to organise authoritative negotiating teams, and has been encouraged to see that both parties are taking steps in that direction,” the State Department said in a statement. A US watchdog agency said last week that the Afghan government was losing control of districts to the Taliban while casualties among security forces had reached record levels. The government had control or influence over 65 percent of the population but only 55.5 percent of Afghanistan‘s 407 districts, the Special Inspector General for Afghanistan Reconstruction said in a report. The latest phase of Afghanistan’s decades-old war began in 2001 when the US-led troops overthrew the Taliban government in the wake of the September 11 attacks on the United States.